Trichord Dino MkIII Phono Stage Opened Box (With Standard Toroidal EU Schuko PSU). Whether you have an ultra-low output Moving Coil cartridge or a high output Moving Magnet the Dino Mk2 will cope easily. A set of user friendly switches on the base of the unit allows you to simply adjust load and gain settings. These settings are vital to match the amplifier to the cartridge and obtain the best sonic result. If your current phono stage only has a couple of options for this function, eg a MM/MC switch, then you are missing out on the ability to tune your system to its optimum. An entire upgrade path exists for this product which allows you to improve performance each step of the way. 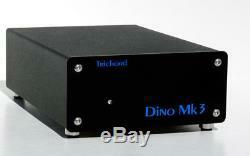 Two main items are required for operation the Dino Mk3 phono stage itself and an accompanying power supply. Start with the basic ac Toroidal Power Supply and work your way up in performance by upgrading to the Dino+ dc power supply, and ultimately to the Never Connected dc power supply. An upgrade from the Dino+ to the Never Connected is also possible by returning your unit to us to upgrade the electronics. To further enhance the sonic performance of these dc power units an upgrade High Performance Power Lead is available to replace the supplied dc power lead. Fully compatible with all previous power supplies. Noise levels reduced by 4.5dB. High quality PTFE gold plated phono connectors on rear panel. Re-designed circuit board with improved ground layout. New analogue output stage using OPA827 op amps greatly improve sound quality. Compatible with MM and MC cartridges. Gain and cartridge loading adjustable by easily accessible DIP switches. INCREASE PERFORMANCE OF YOUR DINO AS YOU STEP UP THROUGH THE VARIOUS OPTIONS. There are three options available to power the Dino Mk3 the Toroidal AC supply, the Dino+ dc supply and the Never Connected Dino+ DC supply. As you go up the range you benefit by an increase in audio performance. All three power supplies are in separate boxes to keep noise and hum levels as far away as possible from the sensitive audio circuits. This is the basic power supply and is provided as a low cost introduction. Performance level will be more than adequate for many users, but you can upgrade at any time to the Dino+ power supply, or for ultimate sonic performance - the Never Connected Dino+ PSU. The ABS molded housing of the Toroidal power supply contains an in-line low noise 40VA transformer. AC current is fed to the Dino where it is rectified to DC and regulated with two high performance, wide bandwidth Super Regulators. The item "Trichord Dino MK3 Phono Stage (With Standard Toroidal EU Schuko PSU) Open Box" is in sale since Monday, November 26, 2018. This item is in the category "Sound & Vision\Home Audio & HiFi Separates\Amplifiers & Pre-Amps". The seller is "airbornehorse" and is located in London. This item can be shipped to United Kingdom, Austria, Belgium, Bulgaria, Croatia, Cyprus, Czech republic, Denmark, Estonia, Finland, France, Germany, Greece, Hungary, Ireland, Italy, Latvia, Lithuania, Luxembourg, Malta, Netherlands, Poland, Portugal, Romania, Slovakia, Slovenia, Spain, Sweden, Australia, United States, Canada, Brazil, Japan, New Zealand, China, Israel, Hong Kong, Norway, Indonesia, Malaysia, Mexico, Singapore, South Korea, Switzerland, Taiwan, Thailand, Chile.